The ClubHouse Academy in Fountain Valley offers a number of Karate classes for children and adults of all skill levels. The Karate-do martial arts form focuses on motor skill and self esteem development through the teaching of blocking and striking techniques. Under the instruction of Tanya Baeza, children will develop coordination, improve balance, and achieve total fitness and self-defense while increasing self-confidence. The ClubHouse Academy proudly serves families in Fountain Valley, Huntington Beach, and surrounding areas. Parents and children are welcome to tour our martial arts facility, watch a class, and even try one for free. If you have any questions, please call 714.593.0753 or send us an e-mail. Ready to sign up? Download a summer contract and bring your completed form to ClubHouse Academy. 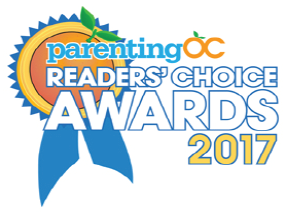 Proud to have been named the Best Martial Arts program in Orange County in the Parenting OC Magazine Reader’s Choice Awards in both 2016 and 2017!